The dress of the bride in the wedding day includesmany details that must be harmoniously joined in one ensemble. Each element has its own purpose and function play an important role decoration. 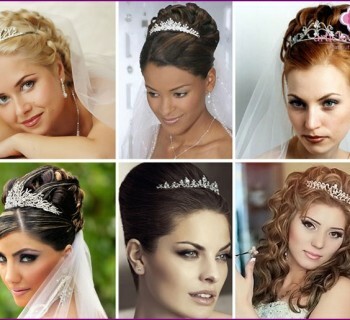 Tiara, earrings, bracelet, necklace - these products complement the bride's dress, give her the image of glamor and glitter. Wedding Necklace focuses on the neckline. It underlines the elegance of the neck or attached shocking mood along. 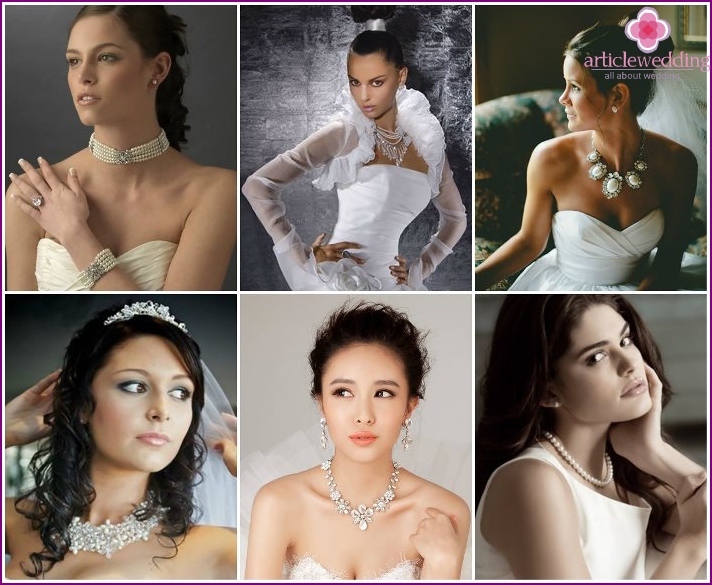 Inspired by the muse, jewelers spendgreat job, making unique jewelry for bridal. Using materials such as cloth, lace, metals, stones, crystals, beads, feathers, they create different shapes, styles, necklaces, ranging from avant-garde, minimalist ending. His masterpieces jewelers are trying to make original and unique. 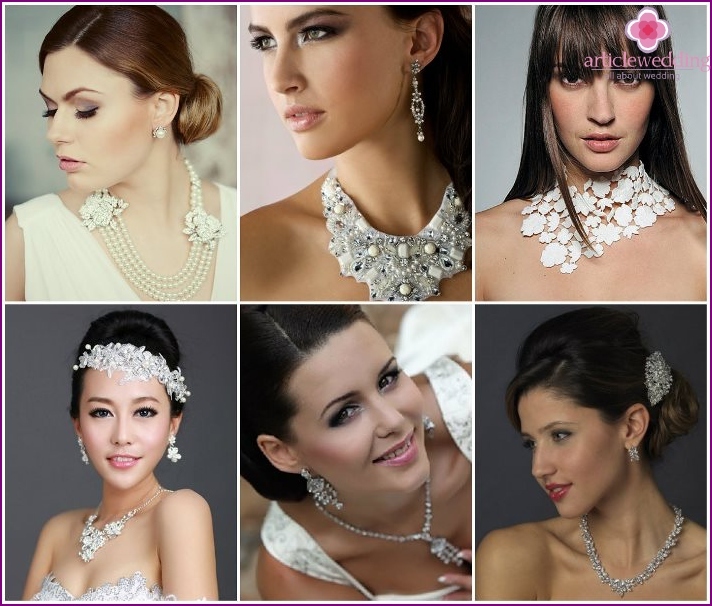 Such a variety of beautiful ornaments turn the head of any bride. 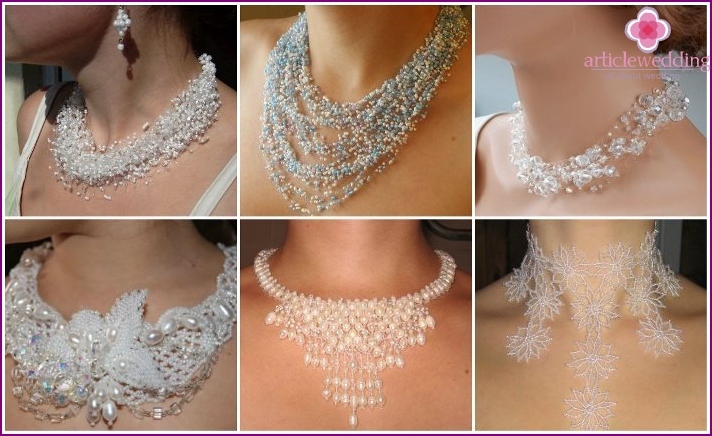 In order not to get lost, follow their taste preferences, choosing the style of dress necklace, decorative elements. These stones are the symbol of purity and innocence,therefore it becomes a kind of classic among bridal jewelry. The pearls are in demand for centuries, captivating women with their beauty. 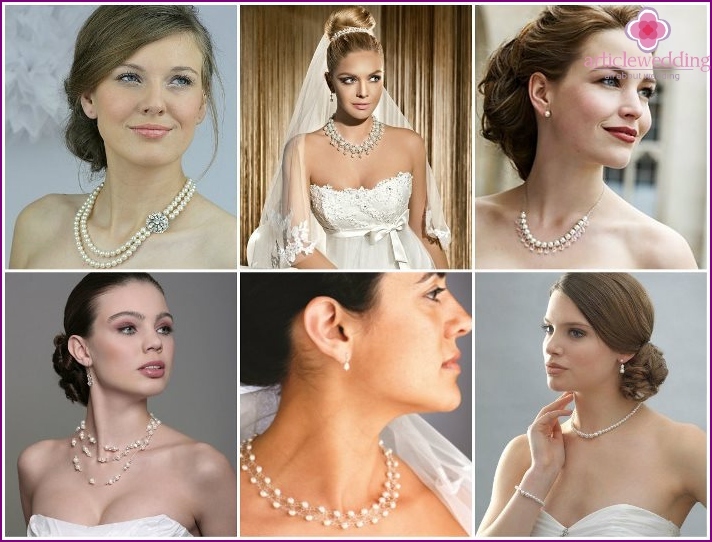 Fine pearl strand, gently enveloping the neck, or a multi-layered composition, decorated with a brooch - any option accentuate the elegance of the bride. 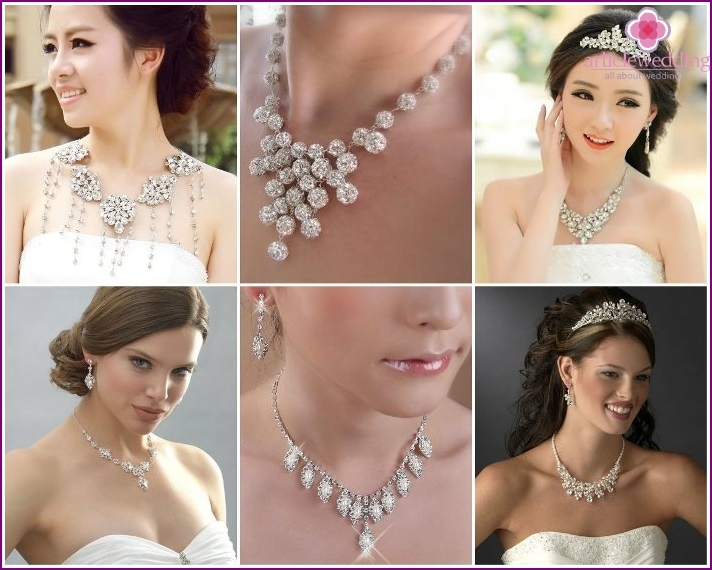 When choosing a costume necklace, keep in mind that it may have a few shades (pure white, pink, blue, gray). At the peak of popularity in the jewelry remainvintage style, inlaid with precious stones. Diamonds wedding necklace will amaze with its beauty surrounding, shimmering in all lighting conditions. Alternatively, use Swarovski crystals, Czech glass, rock crystal, which fit perfectly into the modern minimalist concept of the avant-garde and pop art. Floral motifs are often present inelements of the bride jewelry and flower necklace adorns the bride gives her along the freshness and tenderness. Fine orchids, delicate lilies and roses luxury, combining into a single whole, will create a stunning composition for the bride. Materials for flowers can serve as polymer clay, metal, openwork lace and beads combine the necklace with pearls, fabric, sequins. No women, which would not fit necklacebeads and beads. Openwork weaving decorated with semi-precious stones, creating aerial images, complementing the image of the bride. Beads has many shades that helps to "add color" to the bride's attire. When choosing a necklace please note that it should be minimalist, if the dress is heavily embroidered with sequins or beads. Such decorations bride popular because they are easy to make yourself, or custom-made, then remind yourself of the beautiful day. Necklaces are chosen so that it was part of the ensemble, and blends harmoniously into the image, and did not look the main element. The necklace should match the style of the rest of the jewelry (earrings, bracelets) and accessories. Necklaces should be selected, taking into account the color of the dress or placing accents using jewelery to echo elements in the design of the dress. Do not mix the ornaments of gold, silver and other metals in one set. This choice shows a lack of taste of the bride. Choose a necklace that you like, in this case, you will better yourself in it to feel and radiate happiness. «U» -shaped hole. Such approach along a necklace, tightly clasping the neck. Excellent will look rather short semicircular necklace. This option effectively accentuate the breasts. Square neckline decorates simple necklace, without complicated decorative elements. Good looks fitting neck string of pearls. «V» -shaped hole underline decoration in the form ofthe letter «Y» from descending down suspension. If the dress is bright, then stop standing on a small necklace length slinky neck. This decoration will not distract the attention. If the dress has a neckline shape of a heart, or you wear a dress strapless, to such a garment fit any form of wedding necklaces. The asymmetric neckline. This option does not require decoration necklace. It should be limited to earrings and bracelets. Do not decorate the closed dresses, necklaces simply get lost on their background. 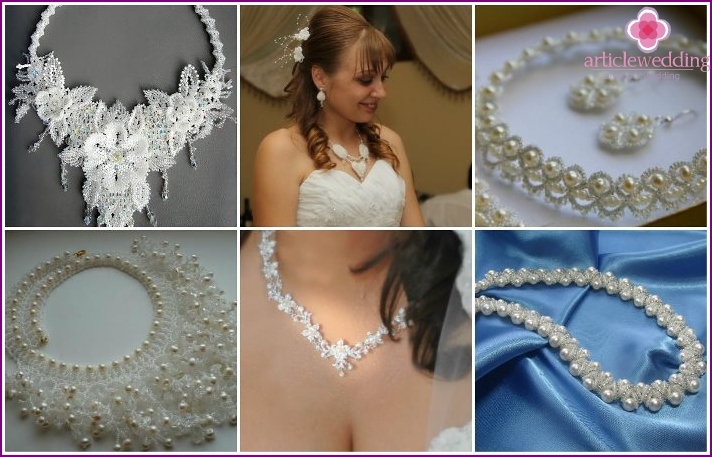 Brides often choose for your wedding ceremonyjewelry handmade. This is due to the fact that girls want to put a part of himself in the details of the celebration to be unique: from glasses and finishing pad for rings. 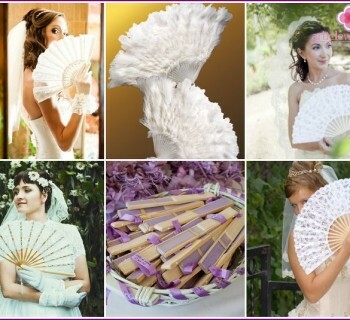 Bride Decoration - is no exception. Why buy the product if there is a desire and ability to make their own amazing necklace. The only one of its kind, this decoration will be a reflection of the creative personality of the bride. For the process of creating necklaces can come in handya variety of beads, crystals, polymer clay, and most importantly - the desire to create. Reviewing the step by step wizard-class represented in the video below, which shows all the stages of manufacture necklace for the bride, you will be able to create a unique and unique accessory for your wedding dress. 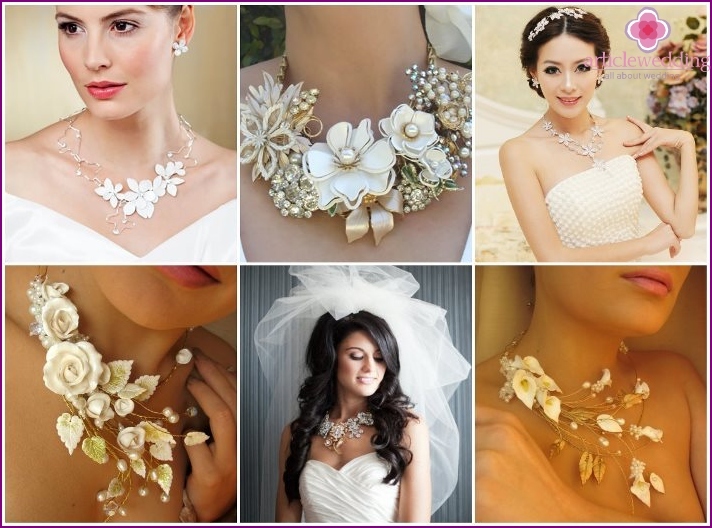 With elaborate necklace will help to decorateoutfit the bride. Necklace of pearls, beads, beads, crystals, gems make its possessor is not just the bride and the real queen's own ball. The main thing - to choose the right decoration. To view some kinds of necklaces and jewelry to see a combination with a variety of dresses you can in the photo below.